What you'll be building in this project is a memory style game, where each button on a 4 x 4 keypad will correspond to an alphabetic character going from 'A' to 'H', and pressing each button will reveal the character associated to it in the OLED display. You win the game when you find all the pair of characters on the keypad. 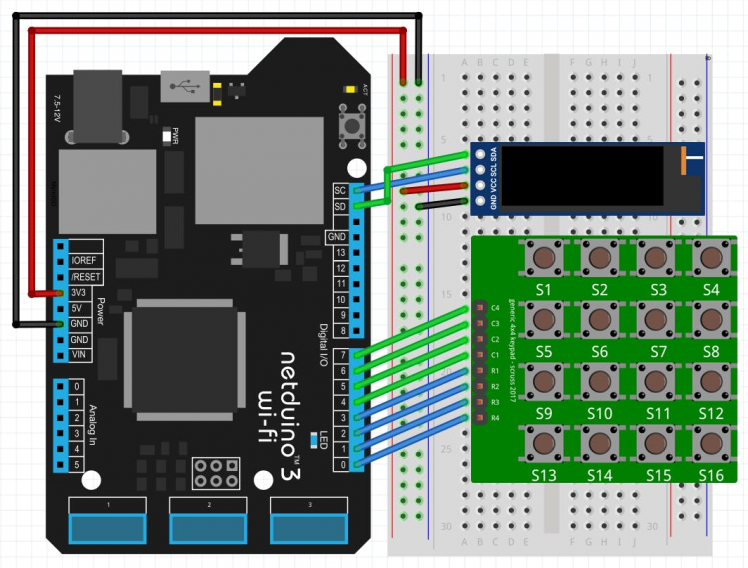 You'll create the logic using Netduino.Foundation. The 4x4 Keypad is a matrix of Push Buttons, where four pins corresponds to four columns and the other four corresponds to the four rows. The way to determine which button is pressed is by setting the column output pins HIGH one at a time at high speed, and when pressing a button and the corresponding column is HIGH, you can detect which row of the matrix completes the circuit and it will emit a signal to the row input pins. You can see a small video tutorial here. For displaying the UI on the 128 x 32 I2C OLED display, you can connect to it using Netduino.Foundation, and for displaying texts and shapes you will use DisplayGraphics, an extended Library of Netduino.Foundation. Create a Netduino project in Visual Studio 2015 for Windows or the latest Visual Studio for Mac; name the project MemoryGame. Right-click on your MemoryGame project and click Manage Nuget Packages. In the Browse tab, search for Netduino.Foundation; it should be the first search result. Click the Install button. You'll use three (2) additional nuget packages. 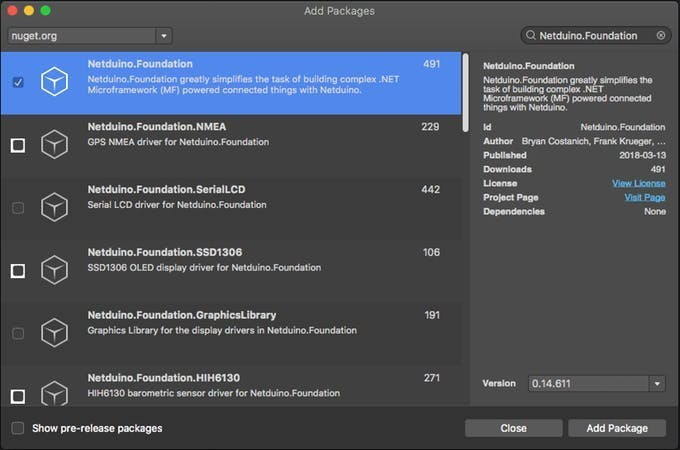 Search for Netduino.Foundation.SSD1306 and Netduino.Foundation.GraphicsLibrary and add each one to your project. 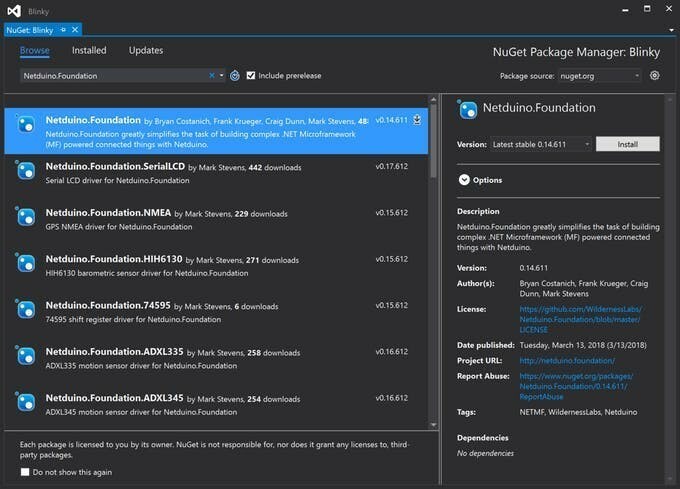 Alt-click on your MemoryGame project in the Solution Explorer, and click Add => Add Nuget Package to open the NuGet Package window. Search for the Netduino.Foundation package and click Add Package to add it to your project. For this project, we implement a common App software pattern that manages all the peripherals and main logic. In the App constructor, we're initializing an array of 16 characters options, which will basically be the board that associate each character to the keypad. The InitializePeripherals() method is used to group all the hardware initialization part. Notice we're initializing the OLED display, specifying the resolution, the speed and the address, and right after, we pass in the display object to GraphicsLibrary, so we can easily draw text and shapes onto it. LoadMemoryBoard() method is called after initializing the app, and what it does is iterate through the optionsPossible char array, and on each iteration calls PlaceCharacter() method twice, so that same letter is placed twice in the board randomly. What the StartGameAnimation() method do is call DisplayText() method which uses the GraphicsLibrary to first clear the entire screen, calls DrawRectangle() to draw a non-filled rectangle around the entire screen, and calls DrawText() to display text at a 8x12 font size with the specified x and y coordinates. In the GameLoop() method is the logic to capture button presses on the Keypad. currentColumn iterates from 0 to 3, and on each iteration, it powers the corresponding column, and also reads all 4 rows, and when one of them reads a true value, depending on the row, we can determine which button is pressed. This happens every 50ms. Too fast could lead to several presses, too slow could not detect any button presses unless you push and hold. We also save lastButton value at the end of each cycle, so we can compare a change with the currentButton, and update the display when theres a change of the button states. In each iteration, we also call IsLevelComplete() to check if all the option values are found to display a You Win message and start the game all over again. Click the run button in Visual Studio to see your memory game in action! Press a button and see the character that corresponds to it and try to look for its pair.